For your next event in beautiful Stratford, let The Parlour Inn’s stunning Winston Churchill room steal the show. For large events, conferences or meetings, the Churchill room can accommodate up to 120 people in comfort with its timeless aesthetic. The Churchill room is the perfect upscale space to host your next company meeting, annual general event, work conference and much more. This venue will set your company apart from others thanks to its upscale and sophisticated atmosphere that is as comfortable as it is beautiful. Your event attendees will enjoy top-notch service and modern business amenities from start to finish. 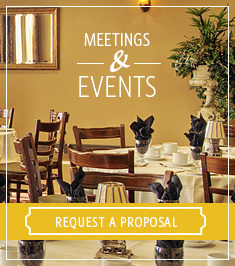 The Parlour Inn’s event spaces offer on-site catering from our award-winning restaurant, The Parlour Steakhouse. We allow you the opportunity to completely customize your menus and select the options that work best for your event. We offer snack and beverage services, gourmet buffets and full 3-course sit-down meals that can be designed to meet any dietary restrictions. Our mandate is to help make your event, meeting or conference as productive as possible by taking care of, and anticipating, all the details. Located in the historic The Parlour Inn, your event guests at the Churchill room will have the opportunity to book a room and have a relaxing stay in our stunning hotel. This option is ideal if your event is a multi-day conference or if your guests would prefer to spend the night instead of driving home at the end of the day. We’ll take care of your guests with our exceptional client service and our centrally-located Stratford hotel is a great starting point for any Stratford festival experience. To book your next event at The Parlour Inn’s Churchill room, please contact us at 1-877-728-4036 or fill out our online request for information form to receive more information. You’ll be able to tour our facilities or speak to one of our conference planners and discover how The Parlour Inn can meet your unique event needs.